The Ambassador of Australia to the Republic of Maldives, H.E. 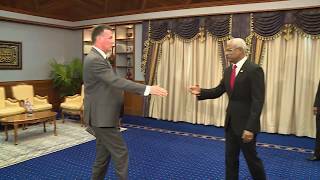 Bryce Hutchesson, paid his farewell call on President Ibrahim Mohamed Solih, this morning, at the President’s Office. During the call, the President conveyed thanks and appreciation for the continuous support and services provided to the Maldives during the Ambassador’s tenure. Noting that the Maldives and Australia have enjoyed a historic and close relationship based on mutual respect, understanding and shared values, the President expressed hope and confidence that the Maldives and Australia will continue working together on international issues of mutual concern, to further strengthen the existing ties between the two countries. In this regard, he highlighted Maldives’ foreign policy priority areas - human rights, climate change, and democratic consolidation. During the meeting, the President also expressed his interest in working together on anti-corruption measures, judicial reform, and human resource development. 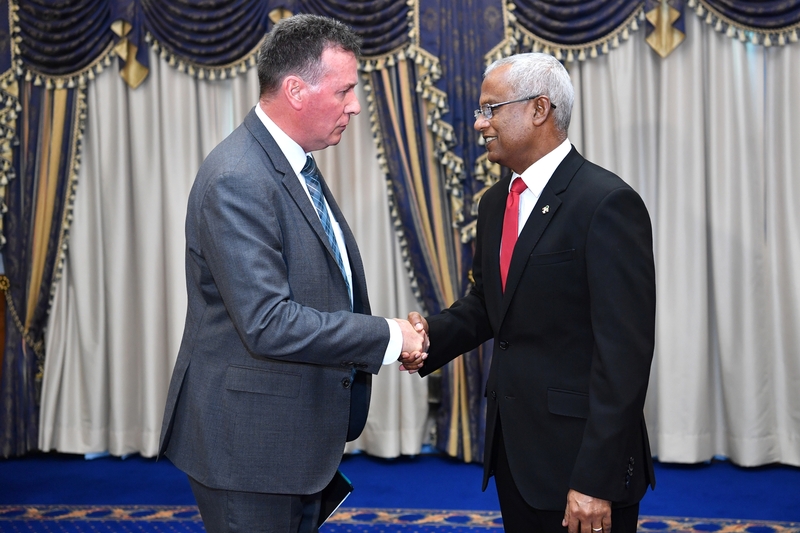 The Ambassador emphasized that it was an immense pleasure to have served as the Ambassador of Australia to the Maldives and assured his commitment to continue working closely with the Government of Maldives in further strengthening the bilateral relations between the Maldives and Australia. He also welcomed the Maldives’ decision to rejoin the Commonwealth. Moreover, he praised the successes of the Government’s 100 day agenda. The call ended with the President wishing the Ambassador success in all his future endeavors.